I bought a little spinning wheel. It’s about the size of an SLR camera and weighs a fraction as much. It came from a Kickstarter campaign I backed. I paid about $50 and like my other favourite Kickstarter reward, it delivered not just on time but early! 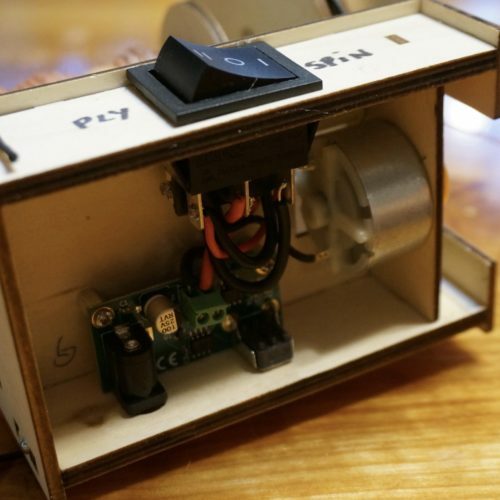 It runs off DC power with a tiny little motor. Years ago I spent a couple of days experimenting with a borrowed treadle spinning wheel and some (in retrospect) appallingly poor-quality fleece. 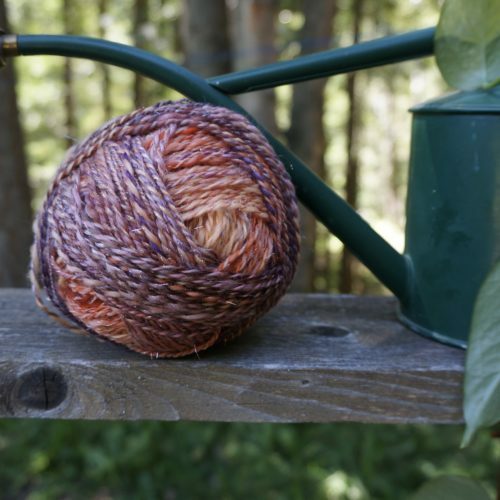 The result was some ‘rustic yarn,’ and the sense of gratification was short-lived. 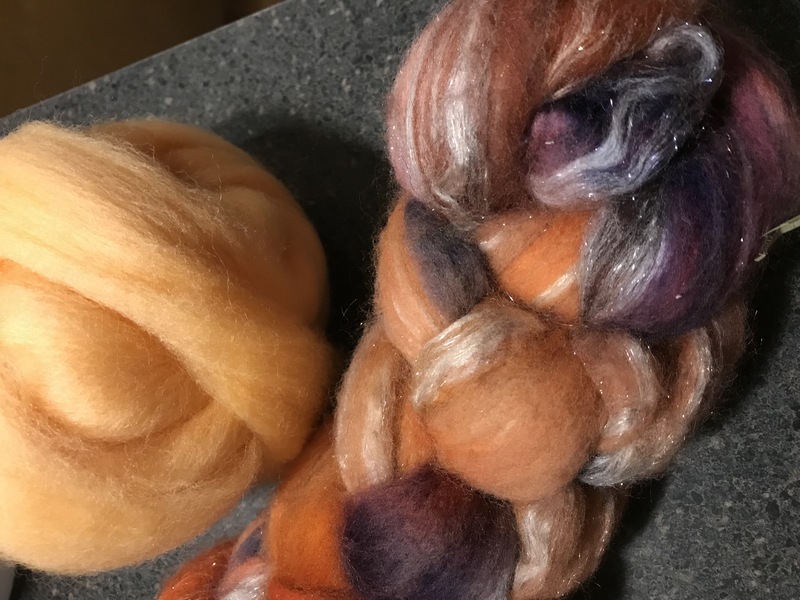 This time around I have used proper spinning-quality roving I purchased, and have made more of an effort to finesse my skills. I am doing much better, and am entirely smitten with the process. What’s most fascinating to me is the way the colours meld. This shows the first stages of the progression. I start with a big pillow of fleece dyed in swaths of different colours, some quite bright and prominent. As I spin one strand at a time onto the bobbin the colours take turns, sometimes blending a bit as they do. 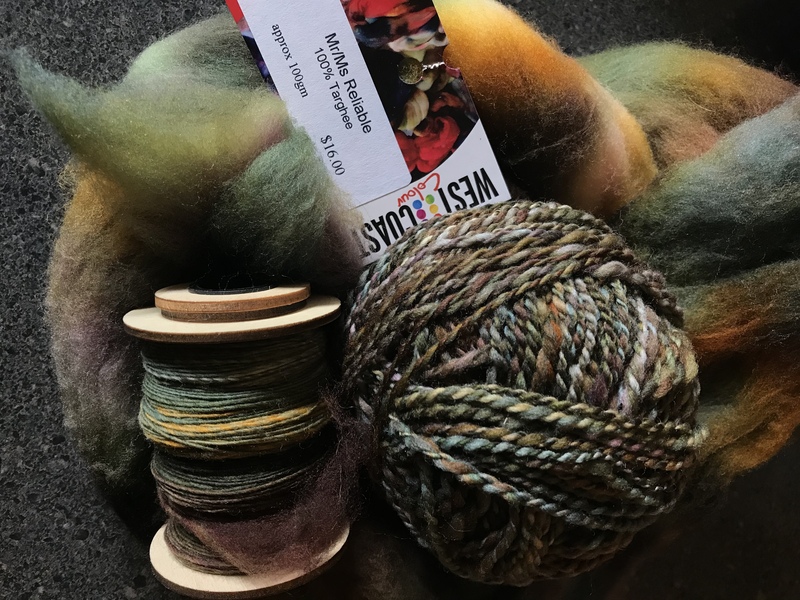 Then, when I ply the strands together into a ball of yarn, the dark and light colours entwine each other as often as not, and the brights become tempered. And then, finally, when the yarn is knitted up into a small project, the knitting creates even more blending and muting. 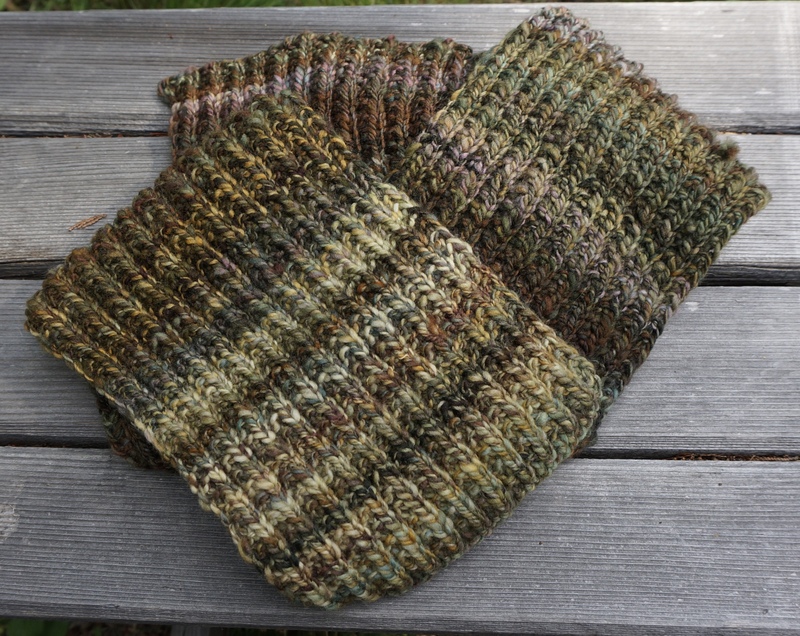 This Scrunchable Scarf ended up being an amazing dapple of forest colours: moss, leaves, humus, lichen, bark and twigs. I would never have guessed how muted it would turn out from looking at the bold brights in the original roving. But here’s the result: still predominantly purple-pink, but with proper yellows peeking out from time to time. It is just about what I was expecting! Here’s another thing: I YouTube-taught myself to solder, in order to install a reverse switch. The original way to reverse the direction (necessary for plying) was to put a figure-eight in the drive belt, but that was causing a fair bit of friction and was unnecessarily fiddly. So I Amazon’d me a DPTP switch and got all the wires going to the right places. And … it worked! But I burned the motor out after just a few weeks. It’s a known issue with this little wheel if the uptake tension isn’t kept very low, exacerbated by the figure-eight drive belt issue I mentioned. They’re sending me a free replacement which is great, and I think I can avoid problems now that I have the reverse switch and know to minimize the tension. I hope it gets here soon; I’m missing the daily meditative colour-play. Also, it’s obvious I need a full-size traditional wheel as well. Need. Yeah. What a lovely yarn/result! I’ve never seen such a tiny spinning wheel. That’s very fun! 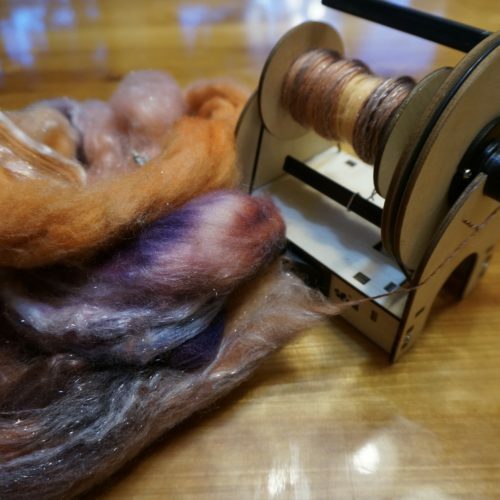 I’ve been spinning using a drop spindle so it goes much more slowly. Also, I tried spinning the soft hair we brushed out of our Great Pyrenees dog last spring instead of sheep’s wool. It works… I got it all the way to crocheting, but it still smells like dog so obviously I need to refine my wool prep technique. Still, fun. And very meditative. The outcome is absolutely amazing. Thank you very much for sharing and please keep up the good work.